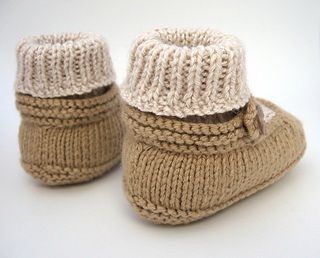 The Baby Merry-Jane pattern is also available in the Baby Triplet Collection - #1 and the Baby Twin Collection - #1. Buy a pattern collection and save! 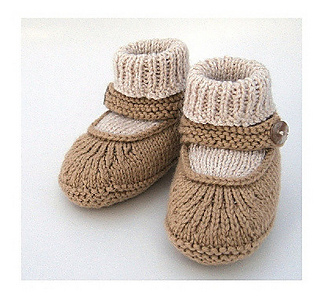 Knit your own pair of baby Merry-Janes with this pattern! 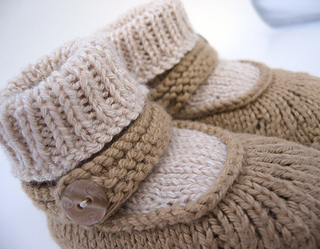 These booties are cozy and stylish, and babies love them! Pattern is 3 pages long and includes easy to follow directions. Additional step-by-step instructions and pictures are provided for confusing areas. Techniques used: Knit, purl, M1L, k2tog, seaming, picking up stitches, and working in a round. Gauge: On US 2 needles, 8 sts and 10 rows = 1 inch.